Episode 81 comes to us by way of our favorite master of the funk infused, squishy bass — the one and only VibeSquaD! This new mix contains a few tunes from his recent album Spinning Gears and Making Things. He also drops a couple of our old favorites, Swivel and Snagglepuss. Also notable are the Spoonbill collaboration and the remixes for Hellfire Machina and previous Memekast selector Freddy Todd (mk075). Definitely one of the most solid Memekasts to date, and we're stoked to be able to share it with you. 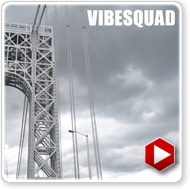 VibeSquaD is a beloved bass music producer/performer/innovator. His trained musical background contributes to his unique take on bass music, which carries him around the country playing packed clubs coast to coast. His signature sound electrifies audiences and his vibrant stage persona will put a smile on your face!